East Valley is a new home community in North East Boise. Located just down the road from Harris Ranch and sitting just below the Boise foothills. Conveniently located near the Greenbelt, the Boise River, and the Ridge-to-Rivers foothills trail system. East Valley offers truly private outdoor space with reasonably sized yards. East Valley features a brand-new collection of single and two level Blackrock Homes floor plans. East Valley homes are designed for comfort, livability, and privacy. Judith Balis, an award-winning designer, has fashioned stunning interiors for the new home collection. Explore our extensive guide to new Boise subdivisions. Or, browse all new homes in Boise by neighborhood, price, builder and more. Boise River, Greenbelt, Ridge-to-Rivers and Boise foothills location. Community park and playground area (future phase). 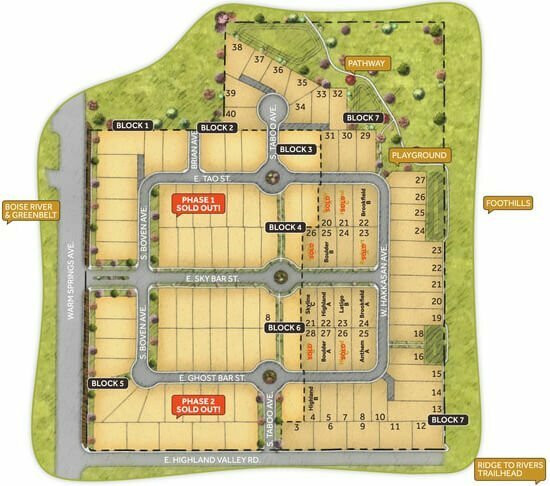 Homesites: 124 building lots ranging in size from 0.14 acres (6,098 Sq. Ft.) to 0.30 acres (13,068 Sq. Ft.). Parkcenter Bridge to East Warm Springs Ave. Turn left (east) on E Sky Bar St - Boise, ID 83716.